When you are stranded overnight without your luggage, one of the most immediate annoyances is the lack of toiletries, in particular the lack of toothpaste and a toothbrush. 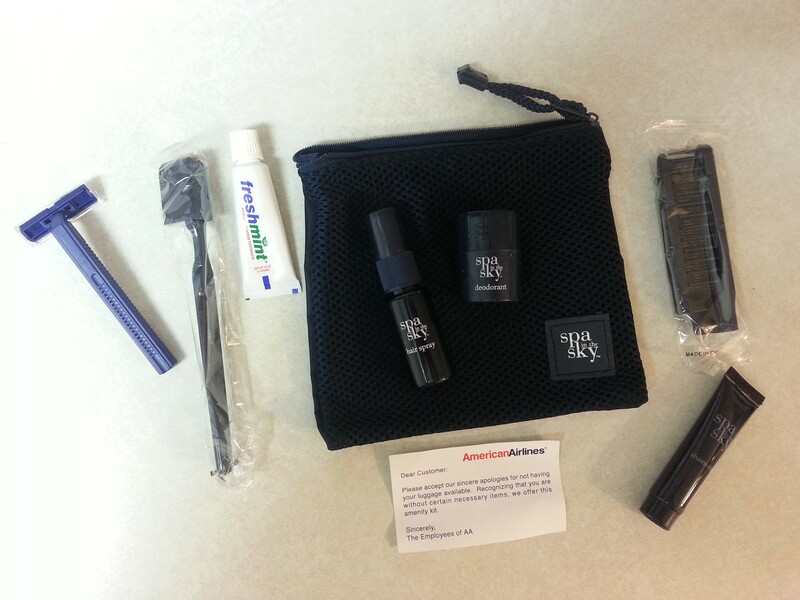 Fortunately, most airlines have small amenity kits, which they offer to all passengers who ask. You just need to know where to find them. Airlines will give out their amenity kits at the luggage counter. Sometimes, especially when weather hits and thousands of passengers are delayed, they will put the boxes of the kits outside of the luggage office, for passengers to pillage at their leisure. At a minimum, you can expect the amenity kit to include a toothbrush, toothpaste, a razor, shaving cream, deodorant, and a comb. Most airlines will offer a little something extra. Delta Airlines (and all of SkyTeam) offers an over-sized (think XXL) SkyTeam t-shirt. American adds hair spray to the kits. If for some reason your airline doesn’t offer an amenity kit, or the line to speak with the luggage counter is intolerably long, many hotels will offer things like toothbrushes and single-service packages of toothpaste to their guests for free. Just ask at the front desk. Generally, the amenity kits come in some sort of small reusable zippered pouch, which is a nice bonus. I reuse the bags to store gadgets or to create amenity kits of my own which I offer to friends who visit me in Minneapolis. Readers, what other tips and tricks do you have for stranded travelers? Have you found a creative way to re-use some airline stuff? Let us know in the comments!